This was the most anticipated DVD release for me in 2006. If you have ever read the first page of this website, then you know of my desire to see all Frederic Rossif films on DVD. This seems to be a difficult matter. Up until now, the only film available on DVD was De Nurember A Nuremberg, rather sad given the long career of Rossif. But this is a good sign. I promoted this release on this website (please go to the front page for ordering information) and encourage people to order this DVD, as it may lead to the release of more Rossif films. As you may know, Vangelis scored Georges Mathieu ou la Fureur d'Être in 1971 and it has never been available commercially before now. This film is even more amazing due to the fact that Vangelis himself appears in the documentary about the great artist, Georges Mathieu. 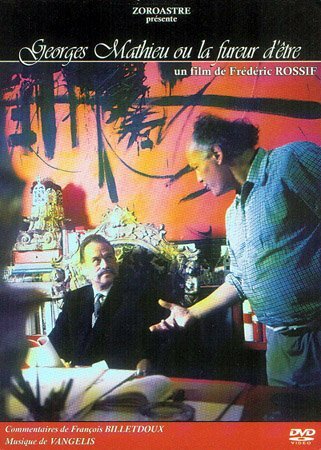 Rossif rarely does a straight forward documentary, and this is no exception. A thoughtful effort that allows for Mathieu to present himself and his work as an active participant in the film, culminating in a demonstration of his technique while Vangelis improvises on his keyboards. Oh, and I love that Vangelis and Mathieu have a sit-down and listen to "All the Seats Were Occupied" by Aphrodite's Child, all filmed by Rossif! Please, you must support this DVD. Buy one today, and who knows, maybe we will see all of the Rossif catalog someday.